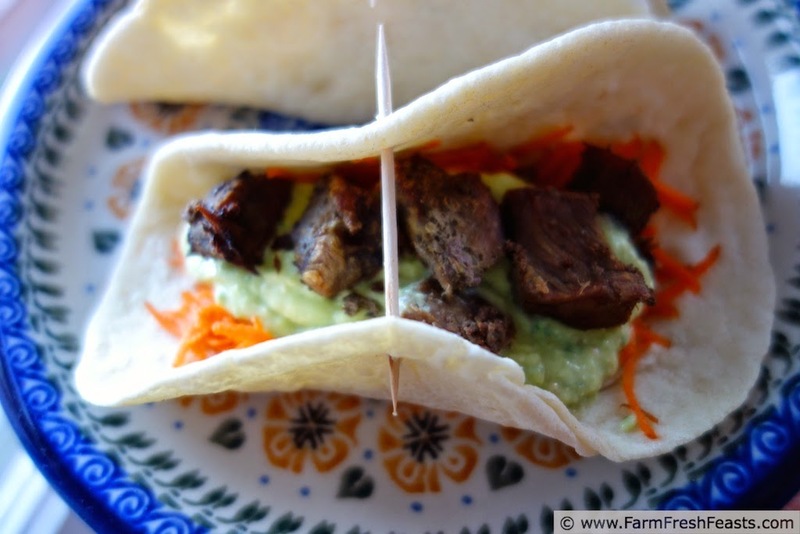 Beef cubes, marinated in artichoke, lemon, and olive juices served taco style with avocado dip. One way to be a meat-eating local food eater is to buy a cow, or part of a cow. We did, and that's how I got the cow that lives in the freezer. One of the cool things about going in on a cow (ok, technically he was a steer), like I've mentioned, is that you get a LOT of cow parts that may be new to you. And in cooking them, you learn new dishes that you love. Like tail. I love me some tail! You also get meats you may be less desirous of--thanks Dawn for bringing over the liver your family isn't fond of--we use it in meatloaf. When you get a portion of cow all at once, you can find yourself with a package of stew meat tucked away in the corner of the freezer when you're not really interested in fixing a stew. 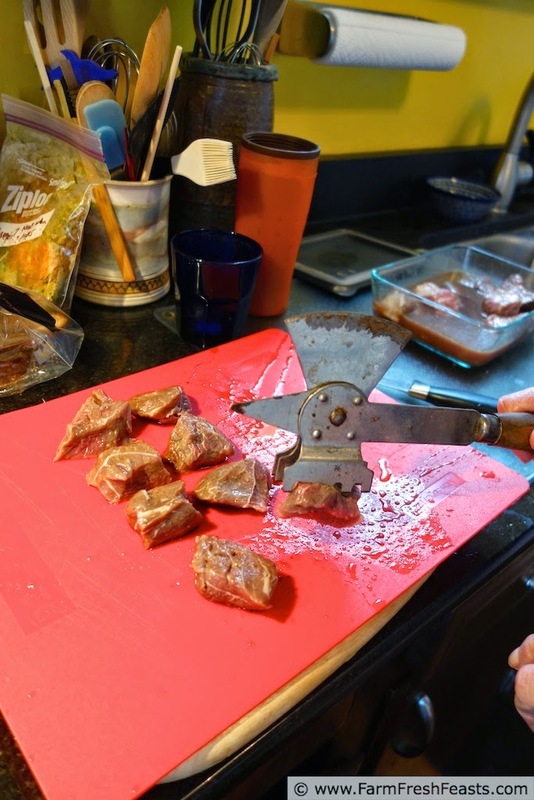 Just because a package says "stew meat" doesn't mean you need to make stew with it. It just means that the meat needs tenderizing, either by long slow moist cooking, or by a long soak in a tenderizing marinade. I opted for the latter this time. This goes back to my mom wanting to use up the liquid left in the olive and artichoke jars because she never throws anything away without some sort of reuse. (See where I get it from?) 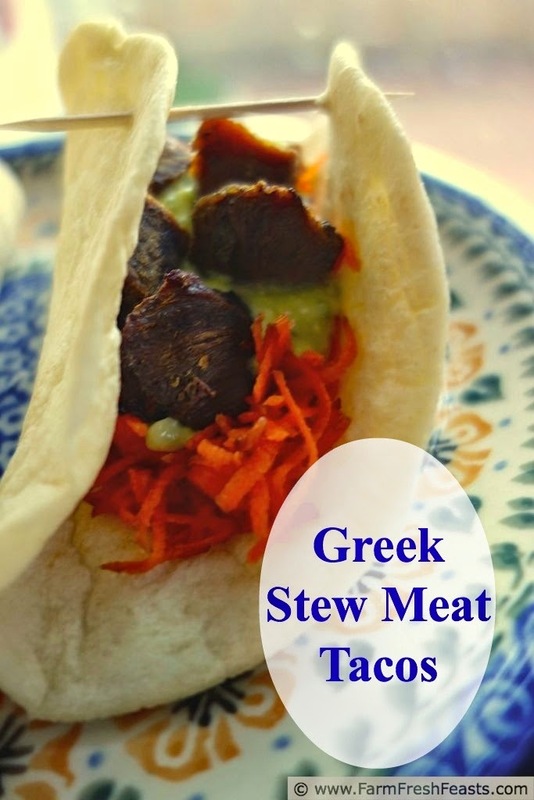 When I made the Slow Cooker Greek Chicken Tacos the artichoke/olive juice marinade made for tasty meat--so I did the same thing with beef. Note: this has an overnight marinade! For more recipes using avocados, please see my Avocado Recipes Collection. For more recipes using carrots, please see my Carrot Recipes Collection. For more recipes using olives, and artichokes, and other veggies in jars, please see my Recipes Using Veggies in Jars Collection. These collections are part of the Visual Recipe Index by Ingredient, a resource for folks like me eating from the farm share, the farmer's market, the garden, the neighbor's garden, and great deals on ugly produce at the grocery store. The medieval way to tenderize meat. And oppress peasants. In a shallow container or zip top plastic bag, combine stew meat with artichoke and olive liquids and ½ of the lemon, juiced (save the other half for the avocado mixture). Let marinate overnight in the refrigerator, or up to 2 days (you can also let the meat thaw for up to 2 days in this marinade, stirring occasionally or turning the bag over so that all sides of the meat are steeped in the juices). When you're ready to cook, preheat the oven to 350 degrees Fahrenheit. Dump the whole thing, marinating liquid and meat, into a shallow pan. Bake, covered, for 45 minutes, then uncover and bake for 20 more minutes or until most of the liquid is evaporated. While the meat is baking, make the avocado dip. 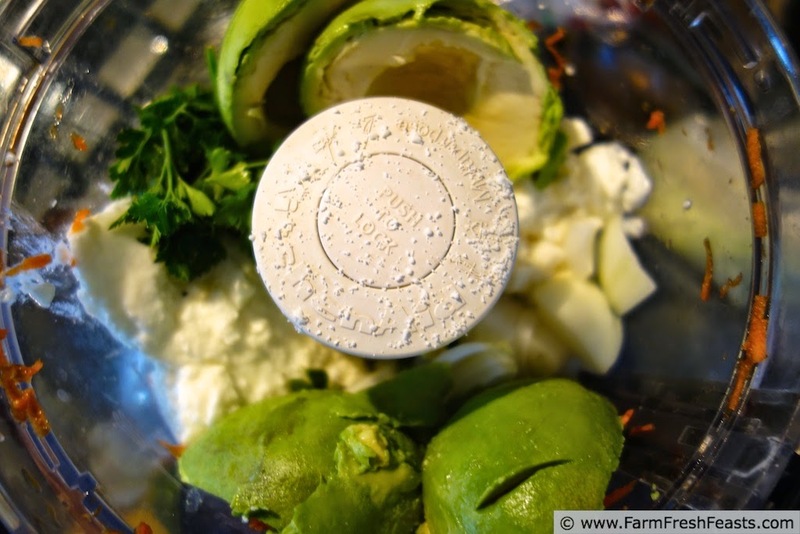 Thoroughly combine the Greek yogurt, avocado, onion, and juice from the other half of the lemon. Stir in the feta, herbs, and jalapeño. 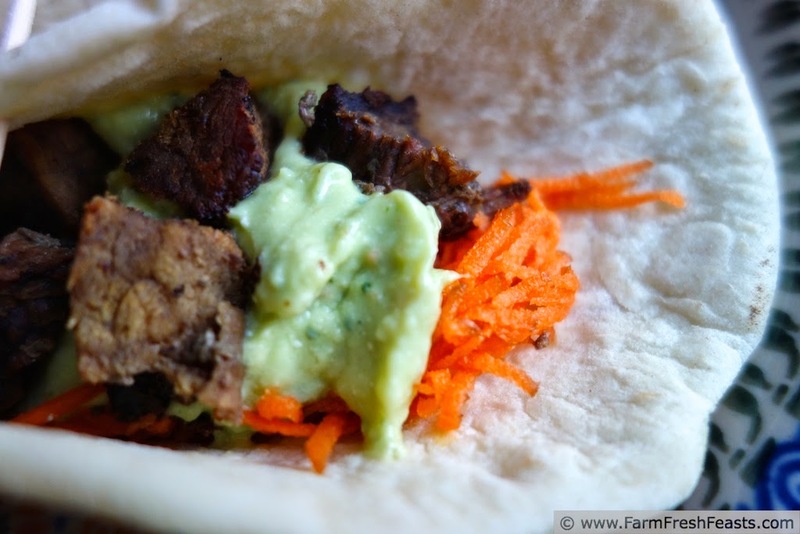 Serve the tacos on the tortilla shell of your choice, topped with shredded carrots and avocado dip. 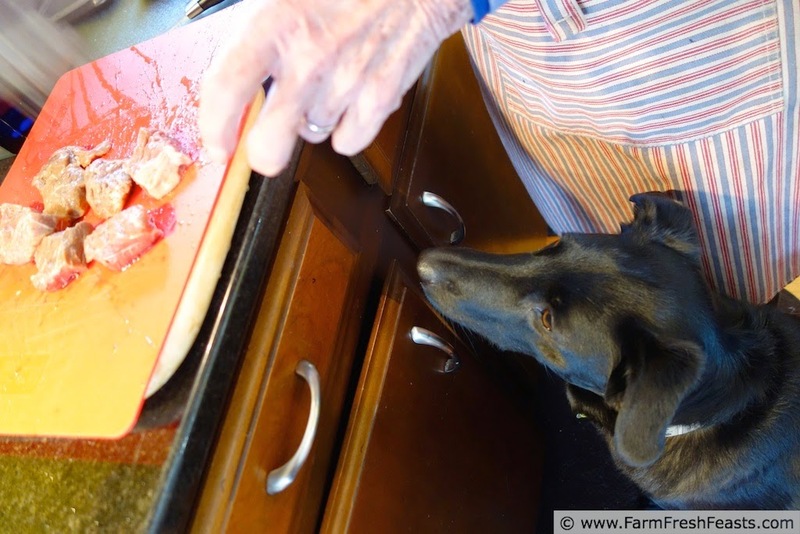 Simon would like to help Grandma in the kitchen. Did I mention my mom won't even throw out pickle juice? It's true. Bless her heart. Now I can't, either. I dump it on the compost pile. Not sure what it does, but it's not going down the drain. A woman after my own heart, my fellow tail lover. Now to discover my love for liver--I swear the packages in the freezer are multiplying. What a fantastic idea to use up the juices we'd just pour away! I hate waste so I usually avoid buying them in the first place. My folks have taught me many many lessons about avoiding waste--see the pickle juice comment above--and I love it when the lessons are tasty, too. You're just building flavors in the food processor is all. I want to make a joke about your love for tail, however since mom is in town I'll refrain. I have never thought to use the leftover liquid in the olives and artichokes jar, yet now that you say it, it seems so obvious. You and your mother are brilliant and will always be brilliant so long as you are rocking that medieval torture device. P.S. Nice to see Simon again. I've missed him. I'll tell Simon. He'll be so delighted that someone likes him (really likes him! ), the standard dog-shaped dog--not just the little and cute dogs. Oliver gets all the attention these days. OH MY GOODNESS! This might have to be on my dinner list this week if not for sure soon! My favorite thing is artichokes!!! Thanks for a new spin on "tacos"!! I think artichokes are da bomb. I keep my Costco membership in part because of their giant jars!